A simple trademark search is your first step. And lucky for you, it’s both easy and free to see what anyone in the U.S. has trademarked. What can you trademark? A word, phrase, symbol, or design that distinguishes the goods and services of one company from those of another. Check a domain registry (e.g., Tierra.net) and search for your trade name as a domain. Someone may already have your name with a “.com” at the end, but not with some of the other extensions, such as “.net.” If that is the case, find their website and see if they are in the same class of goods/services as you. 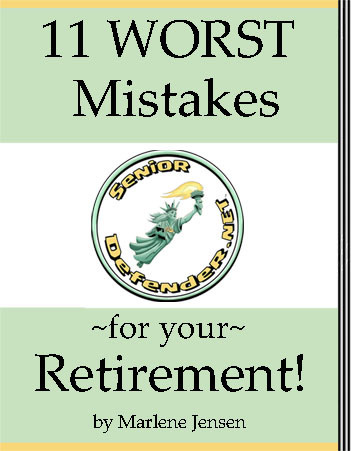 Example: Someone else already had SeniorDefender.com, but it was a law firm. That meant my blog (educational/publishing categories) could still use the name, with a “.net”. If there are no records, then nobody owns that name on a national basis. For fun, I typed in “aging” and found a number of taken trademarks. My favorite was “F*ck Aging.” It’s owned by a Florida gentleman in three different categories: wearing apparel, exercise equipment and exercise instruction. Check your state trademark database. If nobody owns the name in the national database, go to your state’s Secretary of State website and search for their trademark database. STEP 2: PROTECT your name! Put a small TM at the end of your trademark (see SeniorDefender.net trademark at the top of this blog, although the TM is typically put at the top of the last letter, not the bottom). This warns anyone who sees your name that you intend to protect it. Not doing this is as risky as publishing copy without putting a copyright notice on it. People can assume it’s free for the taking. USE the name in business as soon as possible. Run an ad. Print a flyer. And keep proof (in a safe deposit box) of the date you first used it in business. National Trademark: This is the gold standard for the U.S. and it is the only registration that allows you to put a small “R” in a circle by your name. Unfortunately, it will cost you around $1.5 – 3 thousand. Here’s one listing of trademark attorneys by state. (Please note I have not dealt with this organization, so I can’t vouch for it.) Also note there is no reason why your trademark attorney has to be in your state. There’s really no need to meet with them personally. However, ONLY use an attorney who specializes in trademarks and intellectual property — or you’ll regret it! LegalZoom.com, whom I usually like for cheaper alternatives, has a trademark filing operation that doesn’t even search state databases, so I don’t recommend them for this. Make sure your quote from the trademark attorney includes them searching the national and all 50 state databases, as well as unregistered marks. Ask if they include a global search as well, although if they charge extra for it, you might decide the extra money isn’t worth it. Don’t try to do it without an attorney! Yes, you can search all state databases for about $150. Throw in unregistered and it’s $299. Throw in global and it’s $499 total. (These fees from TrademarkEngine.) The U.S. filing fees are anywhere from $225-$400, depending on circumstances. Your attorney will add in $750-$2,000. If you go without the attorney, you are likely to still be waiting after 18 months — with no trademark in sight. I know because that happened to me a couple of decades ago. I had to finally cave in and hire an attorney before I got my national trademark. State trademarks: If you’re only going to do business in one state, a state trademark is all you’ll ever need. But… they can be great for national marks as well. Even if your business is national, a state trademark might be your best next step if money is tight and/or you’re unsure if your business will succeed. The state mark plus at least a minimal website using your trade name as the url will give you plenty of protection until you can see if your business will succeed enough to justify spending the money for the national trademark. Why do I like state trademarks so much as a temporary step for those launching a new business on a tight budget? They put companies on notice that someone already has claims to the name. When someone goes to a trademark attorney, the search will turn up your name ownership. A new company can’t disregard your trademark on the grounds it’s only a state trademark. Trademarks are awarded based on first-used-in-business. By registering the trademark in the state, you have proof of when you first used the name in business. You need only prove that the usage was not limited to that state (make it clear on your website!) and you trump anyone who tries to use the name after you. Please do NOT use this once-semi-OK method of protecting your name. Before the trademark databases (state and national) went online, the only cheap way to protect your trademark was to write it in a letter, along with any visuals, then pay the post office (today about $13) to mail it as a registered letter to yourself. Once you receive your envelop, you put it in a safe deposit box and NEVER open it. If you ever get into a legal battle with another company which is claiming your trademark, you could deliver the unopened, dated registered letter to the judge. The date on it would prove when you had the idea. Nobody knows you own the mark, since it won’t show up in legal searches. You have to sue somebody to prove you own it. The cost of the legal battle would completely negate the money “saved” by going for this type of trademark. ‹ PreviousDramatically Improve Your Memory — in 6-8 Minutes!